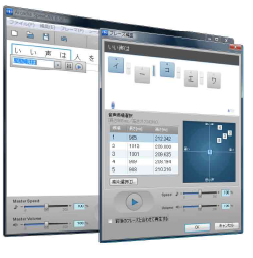 SpeeCAN is an all-in-one software package for speech synthesis and voice/speech related processing. SpeeCAN includes, “SpeeCAN SDK” which enables development of applications using voice/speech, “SpeeCAN SFT” which can tune voice according to your preference, and “SpeeCAN Player” which can perform simple broadcast. SpeeCAN is used in a wide variety of everyday life and business scene. Used for announcement/broadcast in train, bus station, and facilities guidance. Our synthesized voice/speech is highly rated with a quality close to a real announcer. Used for building or on-site broadcasting because a large number of natural-quality voices/speeches can be generated/synthesized in a short period of time. Being appraised for enabling precise and correct voice transmission, SpeeCAN is used in the simultaneous broadcast of disaster prevention administrative radio. Used for car navigation voice guidance because our crisp synthesized voice is easily, clearly heard inside car. No need to full concentrate to hear the voice guidance, thus preventing the driver’s fatigue. Used for simulation games (Roll Playing Games) and mobile/smartphone games. The voice features of the character in the games, is correctly expressed, bringing a more enjoyable game experience. * Please contact us for support of other audio formats. License fee is imposed depending on the purpose of usage. Please contact us for details. Arcadia have proposed the concept of “Voice Rights.” This is the right similar to “Portrait Rights” but in the field of voice. In the case of the corpus-based speech synthesis, contribution from the voice actor and narrator, is very essential. Thus, we need your understanding and cooperation in the protection of the rights of voice actor and narrator, for the dissemination of speech synthesis technology.